One of the most popular places to visit in Auckland also happens to be one of the cheapest! A combined trip to the Auckland Domain and Museum can be a worthwhile trip for the whole family, no matter the age. Located in the central city, and in the suburb of Grafton, the Auckland Domain was originally the site of a Maori pā because of the rich volcanic soil as well as the north-facing views. Maori names the land Pukekawa, which roughly translates to ‘hill of bitter memories’, as many land wars were fought on the site. The land was eventually purchased off the Maori by European settlers and was put aside as a local reserve and later a domain, over time the swap was drained and replaced with a cricket field, exotic donated trees were planted and the Auckland War Memorial Museum was established. The winter gardens were opened in the early 1900s and house an ever-changing array of flowers and plants in a larger Victorian-style glass house. Inside the winter gardens, you will also find native ferns, marble statues, fountains and pools, lavish heat dependent plants and sprawling courtyards. Admission is free. 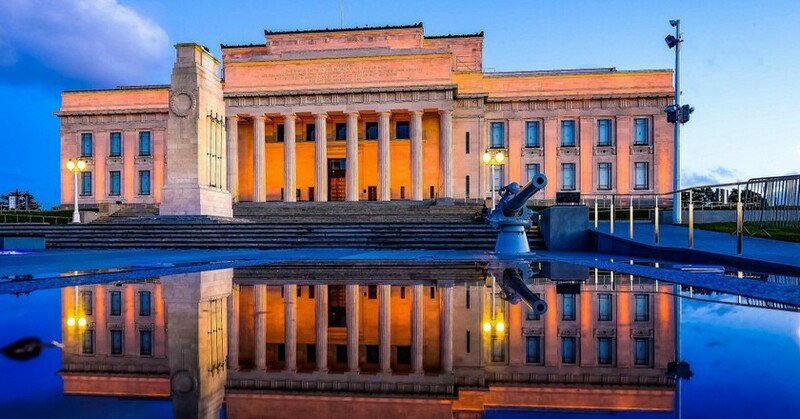 Considered one of the finest Greco-Roman buildings in the Southern Hemisphere, the museum shifted around a few sites in Auckland since its beginnings in 1852 including a farmer’s cottage and the Auckland Society before finally landing on top of Pukekawa in 1921, to commemorate the fallen soldiers of war world one. Since opening the museum has had a number of upgrades and renovations including an administration annexe with a large semi-circular courtyard was added to the southern rear to commemorate the soldiers of war world two. The museum house a number of popular exhibitions including a large collection of Maori and Pacific Island artefacts, including a life-sized meeting house and Te Toki ā Tāpiri – the last great war canoe used in battle and carved from a giant totara tree. The museum also has floors dedicated to domestic and international wars, landmarks and encounters that contains art and artefacts, as well as fossils, history of toys, fashion and more. The museum is free for entry for Auckland locals, a donation is required for New Zealand residents, and international visitors have an admission fee of $25 for adults.